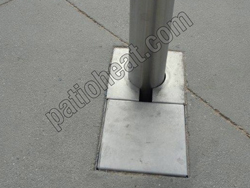 Sunglo Stainless steel permanent NG heater with Underground Vault box. Now making the heater removable and allowing for below grade gas connections. Optional Hose kit sold separately.